The world watched as Tahrir Square filled with protesters in Cairo earlier this year. That happened in late January, and by early September I was watching a documentary in Toronto called Tahrir 2011: The Good, The Bad, and the Politician. It’s remarkable that directors assembled a movie in less than 8 months. That timeliness is the movie’s great strength — at least as long as it lasts. The film is split into three parts. “The Good” is an excellent example of fast and timely documentary. It features half a dozen subjects recounting what it was like in Tahrir square. One young man was seen in news photos jumping on a tank. Another returned home from Denmark where he was studying photojournalism to photograph the revolution. One woman spent her time nursing the injured and setting up a field hospital in a nearby building. I was surprised to be attending a documentary on Tahrir so soon after it had happened. But Tahrir 2011is not analysis; it’s testimony. Neither the subjects nor the filmmaker know what the results of Tahrir will be. But for now, they can say “this is what I saw, and this is my story.” More in-depth documentaries will surely follow, and they will be more focused on stories and subjects who shaped the history of Egypt. This documentary knows that it’s timely, that it is first, and so it focuses — correctly — on the everyday details, presenting a snapshot of what it was like to be there. As with “The Good,” this section of the film is more testimony than analysis. Time will tell whether these stories are accurate and important. 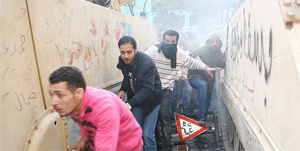 For now, they are a rare look at the other side of the Arab Spring. The final part, “The Politician,” is aimed squarely at an Egyptian audience, so it doesn’t work so well in Toronto or the U.S. It’s a conversation piece that asks “When did it become obvious that Mubarak was a dictator?” This segment uses cartoon bullet points to list the traits of dictators, then checks them off against Mubarak. The impression this Westerner got from watching “The Politician” was that many Egyptians had lived with Mubarak for so long that it never occurred to them that they were living in a dictatorship, and that there was a relatively sudden national awakening. Another film from the festival circuit a couple years ago, 12:08 East of Bucharest, asked the same question: at what exact moment did the magnetic poles of history change — when did the rebels become the heroes and the conservatives the villains? In ten years, we may look back at Tahrir 2011: The Good, The Bad, and the Politician and decide it can be dismissed as naïve and “too early.” After only 8 months, it can’t offer much in the way of analysis. What it can do — and does — is to start the conversation.